When you decided to rent at your community, you were given a tour of the apartment you were interested in, most likely followed a tour of the clubhouse, pool, fitness center, and any other outside amenities. So now as the weather turns colder and your outside workout may be less appealing, please remember that there is a fitness center on site that you can use – for FREE! Stay away from those costly memberships at the local gyms. 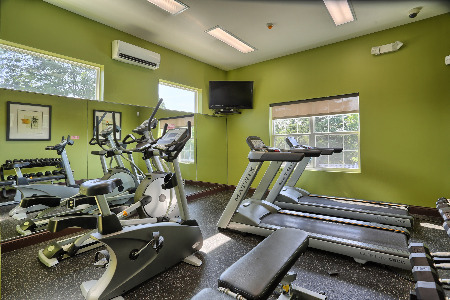 There are so many pluses to working out at our fitness center – it is super convenient (you can probably walk from your apartment), you don't have to pay anything, we have full locker room/showering facilities for you, we have all of the basics that you will need, it's free, the hours are extended so it is open to accomodate most schedules, you don't have to worry about those strict fitness instructors walking around and judging you or trying to sell you on joining their fitness program, and by the way, did we mention it's FREE?!? So now that you know that there is a FREE fitness center on site, maybe you're worried that you don't know how to use all of the equipment. Since we do not have personal trainers to assist you, we wanted to make sure you were comfortable walking in and working out at our fitness centers. We have created a compilation of tutorials via YouTube (including operation of leg press, leg curl, lateral pulldown, elliptical, seated row, some great free weight workouts, and much much more) for your information and enjoyment. Many of these videos also include advisements on preventative measures to take so that you are not opening yourself up for injury while undergoing a weight training or exercise program. Enjoy!